With this project management tool, it is much easier connect all your thoughts, files, tasks, and discussions in one place. The software helps you simplify collaboration with your team. The browser-based online collaboration tool paired with its Chrome extension can help you keep track of your projects, sync team efforts, and above all, allow you to work efficiently in the cloud. The best thing about Wrike is that it can be successfully integrated with any web tool you use. With just one click, you can use this Chrome extension to record tasks in Wrike from any webpage, and then allocate the task to your teammates to work on possible follow-up steps. With this project management software Chrome extension, you can bid goodbye to the days when you would forget a great idea while browsing the web. 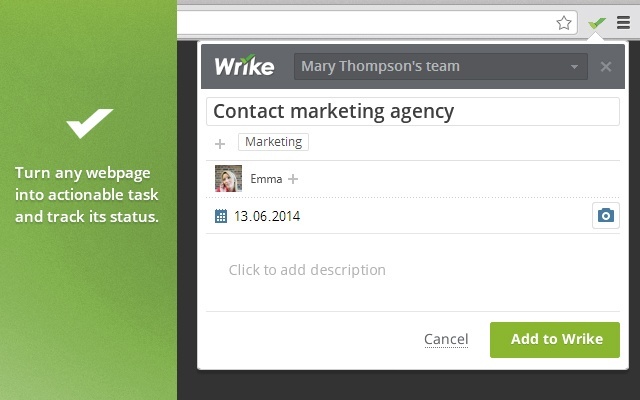 Wrike allows you to turn any webpage you visit into a Wrike task. It will automatically add the URL of the page you are on when you create the task to the comments feed section. Once you’ve created the task, you can fill in task details. Assign your team and the due dates, select folders to house the task in, and update your task description with notes. To provide information and design inspiration from the original site, you may opt to attach a webpage screenshot. You can use the Wrike Chrome Extension to link your teams together, and then do the same for your web tools. For example, the web-based collaboration software can attach a web page from an existing blog post in your CMS program to a Wrike task. From Wrike, you can then easily track edited versions of the text, share potential images, and discuss any kind of changes to collaborate on the work in real time. The most amazing thing is that all this can be done in the office, or remotely from home or abroad. In another use case, the Wrike Chrome Extension can be used to associate tasks with LinkedIn profiles to track the recruiting process for promising candidates. You can then share easily the information with your Executives and mark the recruitment status. Another great feature of the Wrike Chrome Extension: if you have it enabled the next time you visit a candidate page (or any web page), the extension will automatically detect whether the candidate is already associated with a task in your system. It does this by tracking the unique browser URL for page. The Wrike Extension for Google Chrome lets you collect all your ideas, track inspiration, work with your team, and connect all your cloud-based tools in one centralized hub.